State of the Art Diagnostic Testing! Midwest Scuba is raising the bar on our regulator servicing! We are proud to announce that we have recently invested in a top of the line flowbench from Global Manufacturing. 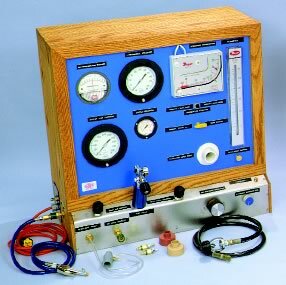 The bench is capable of testing all functional parameters of modern scuba regulators including: air flow rates, inhalation/exhalation breathing efforts at both initiation and during air flow, first stage intermediate pressure, lockup repeatability and stability and systemic air tightness. The importance of flow testing regulators for modern diving, especially technical diving, cannot be over-emphasized. In an era where dives beyond 250 feet are common, a diver must know that breathing equipment can function at operational depth. Excessively hard or restricted air delivery can be deadly. Periodic flow bench testing prior to deep dives allows one to know that air requirements from all system components can be met. Without such testing, no documentable statement can be made about the underwater performance of dive regulators or other systems components. Seeing is believing!! Stop in and let us show you how the flowbench’s diagnostic capability can ensure your regulator is performing its best before your next dive! A $59 labor charge includes the annual servicing of your regulator (both first and second stages), octopus or alternate air source, and instruments. When you have your gear serviced by Midwest Scuba, we disassemble the rig, clean all necessary parts in an ultrasound machine, and reinstall ONLY factory supplied service kits. All hoses are cleaned and applied with a coating of silicon to prevent cracking. In addition, new o-rings are installed in all hoses including the small o-rings in the SPG. Once reassembled, the regulator is tuned to factory specifications. In the end, you’ll be confident that your rig will perform at its best. The cost of parts kits will vary depending on make and model. Bring in your Annual Service Parts Benefit Warranty information and your parts kit(s) will be free of charge. We handle all repairs and service in house by our ScubaPro Certified Service Technicians.